Honey enjoys great demand as food and medicine. Ultrasonic processing is an effective means to destroy undesirable components, such as crystals and yeast cells in honey. As a non-thermal processing technology, it causes lower HMF increase and better retention of diastase, aroma and flavor. Honey is high viscosity product of characteristic flavor and aroma, color and texture. 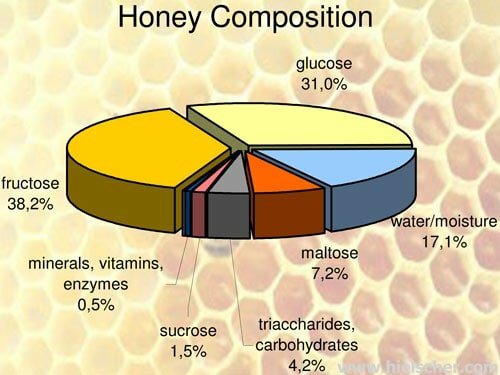 Honey consists of glucose, fructose, water, maltose, triaccharides and other carbohydrates, sucrose, minerals, proteins, vitamins and enzymes, yeast and other heat-resistant microorganisms and small amounts of organic acids (see chart to the right). High level of tetracyclines, phenolic compounds and hydrogen peroxide in honey give is antimicrobial properties. Honey contains starch digesting enzymes. Enzymes are sensitive to heat and therefore serve as an indicator of honey quality and degree of thermal processing. Major enzymes include invertase (α-glucosidase), diastase (α-amylase) and glucose oxidase. These are nutritionally important enzymes. Diastase hydrolyses carbohydrates for easy digestibility. Invertase hydrolyses sucrose and maltose to glucose and fructose. Glucose oxidase catalyses glucose to form gluconic acid and hydrogen peroxide. Honey does also contain catalase and acid phosphatase. The enzyme activity is generally measured as diastase activity and is expressed in a diastase number (DN). Honey standards specify a minimum DN of 8 in processed honey. Extracted honey contains undesirable materials, such as yeast (generally osmophillic, sugar-tolerant) and other heat-resistant microorganisms. They are responsible for the spoilage of the honey during storage. A high yeast count leads to a rapid fermentation of honey. The rate of the fermentation of honey is also correlated to the water/moisture content. A moisture content of 17% is considered to be a safe level for retarding yeast activity. On the other hand, the chance of crystallization increases with decrease in moisture content. A yeast count of 500cfu/mL or less is regarded as a commercially acceptable level. 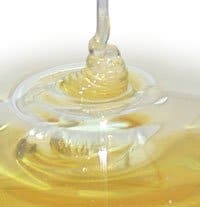 Honey naturally crystallizes as it is a supersaturated sugar solution, with more than a 70% sugar content relative to a water content of about 18%. The glucose spontaneously precipitates out of the supersaturated state, through losing water as it becomes a more stable saturated state of glucose monohydrate. This leads to the formation of two phases – a liquid phase on top and a more solid crystalline form below. The crystals form a lattice, that immobilizes other components of the honey in suspension, thus creating a semisolid state (National Honey Board, 2007). Crystallization or granulation is undesirable as it is a serious problem in processing and marketing of the honey. Also, crystallization limits the flow of unprocessed honey out of storage containers. After extraction and filtration, honey undergoes thermal-treatment in order to reduce the moisture level and to destroy yeast. The heating does help to liquefy crystals in the honey. Although, heat-treatment can effectively reduce moisture reduction, reduce and delay crystallization, and destroy yeast cells completely, it does also result in product deterioration. The heating increases the level of hydroxymethylfurfural (HMF) considerably. The maximum permissible statutory level of HMF is 40mg/kg. Furthermore, heating reduces enzyme (e.g. diastase) activity and affects sensory qualities and reduces the freshness of the honey. Heat processing darkens the natural honey color (browning), too. In particular heating above 90°C results in caramelization of the sugar. Heat-treatment falls short in the destruction of heat-resistant microorganisms. Due to the limitations of heat treatment, research efforts focus on non-thermal alternatives, like microwave radiation, infrared heating, ultrafiltration and ultrasonication. Ultrasonication is a non-thermal processing alternative for many liquid food products. Its mechanical power is being used for a gentle yet effective microbial inactivation and particle size reduction. When honey is exposed to ultrasonication, most of the yeast cells are destroyed. Yeast cells that survive sonication generally lose their ability to grow. This reduces the rate of honey fermentation substantially. Ultrasonication does also eliminate existing crystals and inhibit further crystallization in honey. In this aspect, it is comparable to heating the honey. Ultrasonically aided liquefaction can work at substantially lower process temperatures of approx. 35°C and can reduce liquefaction time to less than 30 seconds. Kai (2000) studied the ultrasonic liquefaction of Australian honeys (Brush box, Stringy bark, Yapunyah and Yellow box). The studies showed, that sonication at a frequency of 20kHz liquefied the crystals in the honey, completely. Ultrasonically treated samples remained in liquefied state for approx. 350 days (+20% when compared to heat treatment). Due to the minimal heat exposure, ultrasonic liquefaction results in a greater retention of aroma and flavor. Sonicated samples show only a low HMF increase and a low decrease in diastase activity. As less thermal energy is needed, the application of ultrasound helps to save processing costs when compared to conventional heating and cooling. The studies of Kai also revealed, that different types of honey require different intensities and times of sonication. For this reason, we recommend the conduct of trials using a bench-top size sonication system. Preliminary tests should be conducted in batch mode, while further processing trials require a flow cell for pressurized recirculation or in-line testing. Please use the form below, if you wish to request additional information regarding the use of ultrasound in the processing of honey. Subramanian, R., Umesh Hebbar, H., Rastogi, N.K. (2007): Processing of Honey: A Review, in: International Journal of Food Properties, 10: 127-143, 2007. Kai, S. (2000): Investigation into Ultrasonic Liquefaction of Australian Honeys, The University of Queensland (Australia), Department of Chemical Engineering. National Honey Board (2007): Fact Sheets, CO, U.S.A.